Provide comfort for the family of Carrie Hendrix with a meaningful gesture of sympathy. 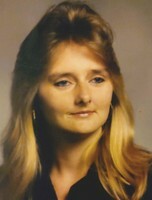 Carrie Ann Hendrix, 51, passed away peacefully April 3, 2019. She was born February 27, 1968, to her parents, John and Sharon Linton. Carrie is a native to Pensacola, Florida, where she has worked at Walmart for nineteen years. She is preceded in death by her father, John Linton; brother, William (Billy) and sister, Telah. Carrie leaves to cherish her memories: her dearly beloved husband of 27 years, Sam Hendrix; mother, Sharon; brother, Bobby; many nieces, nephews, cousins, family and friends. Visitation will be from 2:00 p.m. until memorial service begins at 3:00 p.m. Saturday, April 13, 2019 at Trahan Family Funeral Home, Pensacola. To send flowers in memory of Carrie Ann Hendrix, please visit our Heartfelt Sympathies Store. Provide comfort for the family of Carrie Ann Hendrix by sending flowers.